Learn how to reduce taxes and take home a larger tax refund. HEY, FAMILY! DOES ANY OF THIS SOUND FAMILIAR? 1. You feel like taxes are way too complicated. You have ideas and goals of making sure you’re staying up-to-date on all your taxes, but actually following through on them doesn’t happen because you get overwhelmed by tax jargon. 2. You feel overwhelmed, scared, and don’t know where to start. You’re working hard to save and plan for tax season, but it’s hard to think about it because you have too much going on to surf the web. Plus, you don’t know anyone who can help you. You wish you had more advice on how to prepare and save for the tax season, but you’re not sure where to find information on it. 3. You believe you’re missing out on huge tax-savings. When you think about taking action, it’s usually short-lived because you start doing online research, but get discouraged with all the conflicting information on the web. The result is that you end up doing your taxes last minute and you leave a lot of money on the table. If these things ring a bell with you, then you’re in the right place! The Quick and Easy Tax Planning Strategies Guide is designed to help you overcome these headaches. The Quick and Easy Tax Planning Strategies Guide will show you how to take control of your tax-savings with the best tips you never knew you needed. Part II includes a bonus printable Tax Preparation Checklist that will help you succeed. If you’ve been wanting to understand how taxes work for everyday people, but you don’t know where to start, then the Quick and Easy Tax Planning Strategies Guide is for you. It will teach you how to plan your tax strategy throughout the year. 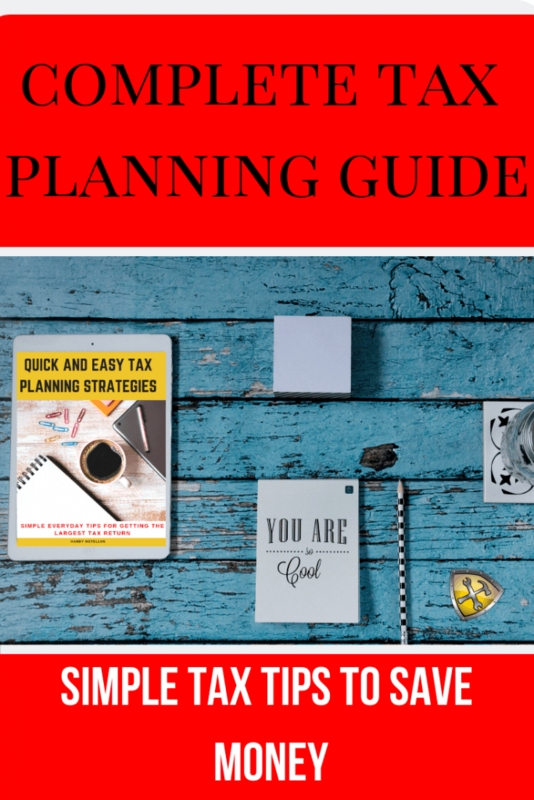 If you are someone who works hard and wants to save your hard-earned-money, then the Quick and Easy Tax Planning Strategies Guide is designed for you. This will help you learn ways to maximize and take advantage of all your tax savings like a pro. If you’re not into putting a little effort into your tax and money-savings goal, then this isn’t for you. 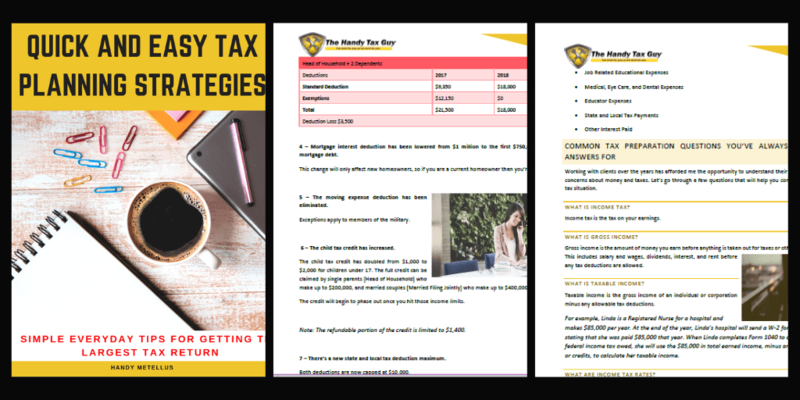 The Quick and Easy Tax Planning Strategies Guide is a digital guide and workbook that makes you take action! You won’t see any results unless you do the work. If you like to read but you don’t ever take action, then this is not for you. If you can’t see yourself actually writing down your money and tax-saving goals, then this is not for you. This ONE-TIME payment of $19.95 gets you access to do the eBook right away! 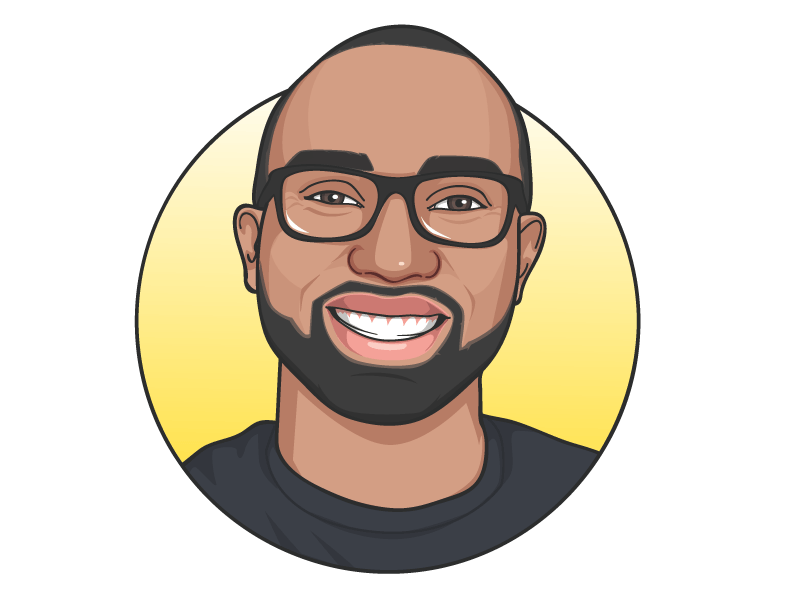 Working with tax clients in the past has helped me combine my many years of experience to create a blog that will help you take control of your finances. My goal is to give you simple everyday tips that you can use right away. The first step to taking control of your money is your mindset to do so. Since you are here, I know you’re ready to reach your financial goals. I believe in putting pen to paper in order to make the goal and journey real. This is an eBook that is informational. The first half is Part I, which is the actual eBook, where I give you tax preparation tips. Part II includes resources and a tax preparation checklist. How is the Quick and Easy Tax Planning Strategies Guide different than other tax book? 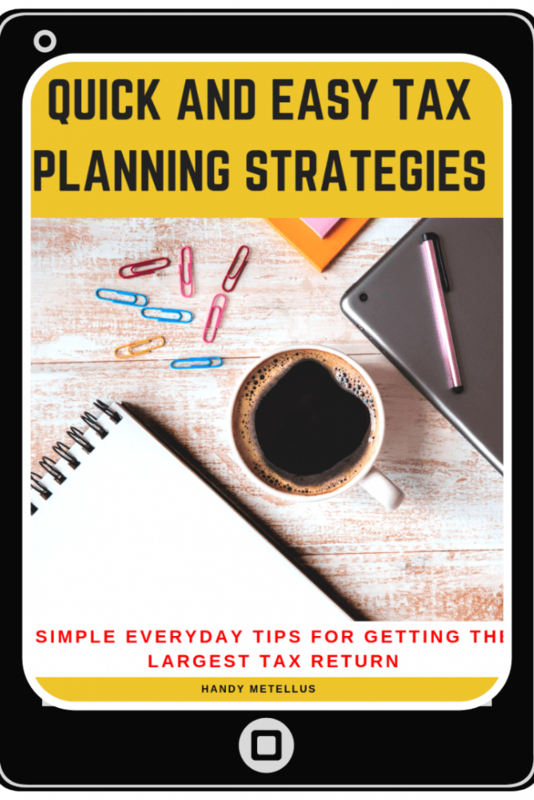 Quick and Easy Tax Planning Strategies Guide focuses on proven beginner tips that help alleviate the stresses of tax planning. Most other books focus only on general information with hard to understand terms, whereas this book gives actionable items and information to get started quickly. The Quick and Easy Tax Planning Strategies Guide eBook can be printed and is not an editable PDF. Quick and Easy Tax Planning Strategies Guide is a digital download. 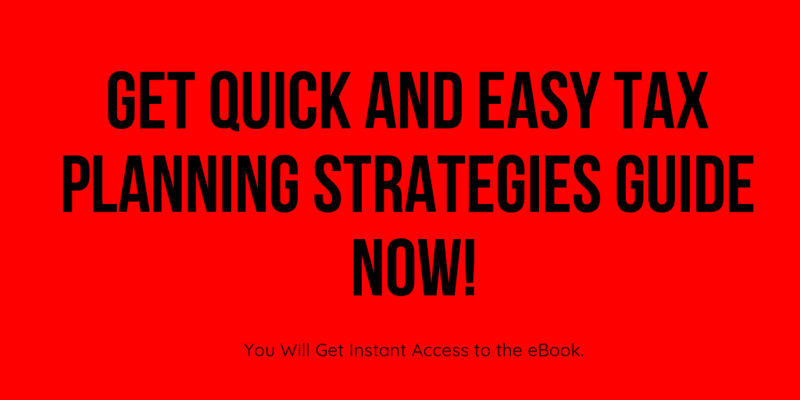 As soon as you purchase Quick and Easy Tax Planning Strategies Guide, I’ll send you an email. The email will have a link for you to click to download the eBook. 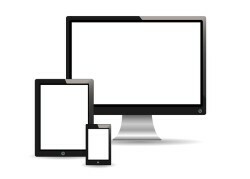 You can read the guide on your phone, computer, or other electronic device. You can also print it. How to reduce taxes and take home a larger tax refund. Buy Complete Guide Now For $19.95! ***All data and information provided on this workbook is for informational purposes only. The Handy Tax Guy makes no absolute representation to the correctness, mistakes, omissions, delays, appropriateness, or legitimacy of any information on this workbook. This is an instant download. There will not be anything mailed to your home. By purchasing this product, you realize it is limited for use by only the purchaser and may not be re-distributed in any way.